“Charleston Harbor is one of the finest natural harbors on the Atlantic Coast. It is one of the most important economic assets of the State of South Carolina serving both commercial and military navigation,”1 states a 1966 Charleston Harbor Water Quality Study. Fifty three years later that still rings true. Preserving the harbor’s water quality is just as important today, as the city and its economy continue to grown dramatically. 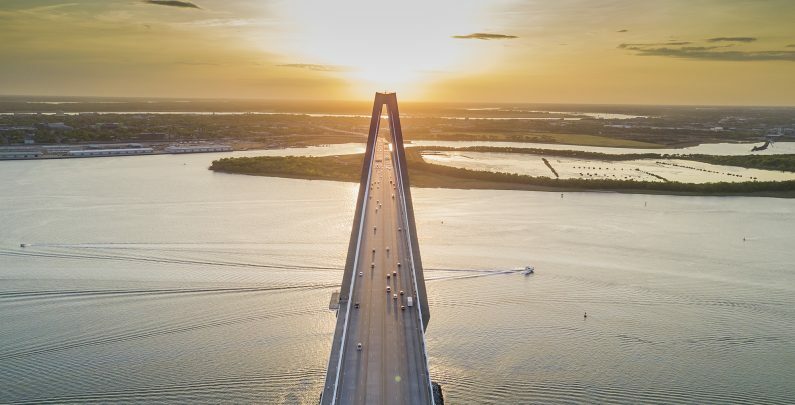 Charleston is no stranger to growth or history, as it was advantageously established on the peninsula between the Ashley and Cooper Rivers, and its harbor has been an economic center since early colonial days. The water quality study is a reminder of the challenges still ahead for South Carolina’s shoreline. Land development and large commercial or industrial sites, in particular, can each have exponential effects on nature’s own management of rainfall and runoff. New impervious development creates immediate point sources for pollution which could contribute to nasty algae blooms and environmental deterioration that spreads from the shoreline; damaging wetlands, waterways and eventually the local tourism industry. Brigade Street in Charleston is within reach of the Cooper River, an area with a rich history of tourism and wildlife, at the mouth of Charleston Harbor. The new owner/developers and the engineering firm, Thomas & Hutton, were presented with a number of additional stormwater design challenges as major plans were in place for a large-scale multi-family home residential development. First, 107 Brigade Street or Pollack Shores development’s known groundwater elevations are very shallow, with pre-existing contaminated soils and a drainage pattern toward the adjacent protected wetland. The location and conditions would need feasible water quality solutions that could address high water tables, minimal space, contaminated soils, and strict regulations on nitrogen pollutants. There are heightened stormwater concerns and regulations around development sites within Charleston Harbor and this site is particularly challenging. High soil contamination makes nitrogen a major concern for governing agencies as well as total suspended solids (TSS), phosphorus, and heavy metal removals. Beyond the regulations, stormwater system(s) would have to address shallow groundwater elevations and adjust to accommodate high flow rates at a very shallow depth. Per city stormwater regulations, outfall couldn’t go below a certain elevation. A stormwater system would have to accommodate shallow flows across the development. The collection of challenges is difficult to address, but finding a system that could successfully work with the shallow height was essential. Beyond that, engineers had to also design within a small footprint, keep costs down, and source systems that have proven treatment and records of requiring minimal maintenance. “Many stormwater products can’t effectively operate at this flow rate in such a shallow restriction, and would cost too much to install and maintain. 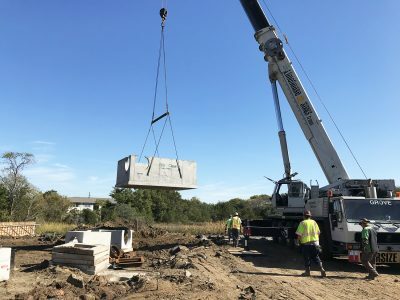 They’re not economically viable for new developments with site restrictions, space limitations, and local regulations,” states Scott Sertich, Director of Engineering for Bio Clean. Moreover, the stormwater system would need verified/proven data showing high removal rates of TSS, phosphorus and heavy metals. First, the Kraken™ Membrane Filter was a clear candidate for its proven ability to sit within relatively small footprints and treat specific levels of nitrogen and large pollution concentrations of TSS (89%), trash, phosphorus, and metals. Kraken’s™ individual membrane filters are washable and reusable; easy and inexpensive to maintain. The Kraken™ Filter provides higher treatment flow rates in a smaller footprint. Each 7.5 inch diameter filter cartridge has 170 sq. ft. of media surface area. With this much surface, the Kraken™ can operate at a loading rate of only 0.05 gpm/sq. ft. of media surface area. “Another benefit to the Kraken was its ability to get a fairly shallow drop across the structure and still work properly. Satisfying city stormwater regulations,” stated Brittany Bowers. The Bio Clean™ engineering team worked quickly with Thomas & Hutton to solve challenging configuration requests and variations from the standard designs that the systems and Bio Clean’s™ team could solve without incurring any extra costs. The Kraken™ and SciClone™ accommodated requests for pipes in configurations different than 180 degrees from each other, ie – an inlet pipe through the sidewall of a Kraken™, or an outlet pipe at 90 degrees in a SciClone™. Lower the rim on the SciClone™ to match finished grade. Add an anti-flotation collar and thicken the bases of the Kraken™ and SciClone™ in order to overcome buoyancy issues due to high local groundwater. Steepen the angle of the inlet pipe into the SciClone™ so that the inlet and outlet pipes would be at the same elevation. Shift the membrane filters within the Kraken™ to one side of the vault, accommodating two inlet pipes, and saving the developer an added cost of a junction box. Work carefully with the Thomas & Hutton to establish finished grade, top of concrete, and pipe elevations. This allowed the Kraken™ to fit into the site, function properly, and provide access for maintenance. Southeastern coastlines, northern lakes, and western rivers; regardless of the challenges and degree of sensitivity on each water body, resourceful collaboration and versatile stormwater solutions will always have success. For Charleston, limited space, high water tables, and other unique requirements were efficiently overcome with experienced teams of stormwater and engineering experts. The Kraken™ is an efficiently engineered stormwater membrane filter that provides high flow rates and over 170 sq.ft. of surface area.This much filter surface area allows it to operate at a loading rate of only 0.05 gpm per square foot, to ensure maximum performance and minimum maintenance. The Kraken™ Filter’s low loading rate allows it to keep maintenance needs low and prevent clogging issues often found in other filter systems advertising high loading rates.